Named after the famous Gourmand, this cheese is light textured but very rich in flavour due to the addition of cream. 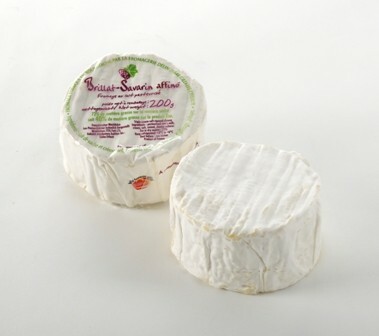 Brillat Savarin is a triple cream cheese that was originally made in Normandy in the late 19th century and went by the name ‘Excelsior’ or ‘Délice des gourmets'. Iit was the first cheese of its kind to be enriched with fat in the form of cream and was created as a cheese that could feature at grand gastronomic meals. The present name of the cheese is attributed to Henri Androuet in the 1930s - the founder of our Parisian partners, the Fromagerie Androuet - in homage of the celebrated French gastronome Brillat-Savarin. Triple cream cheeses muct have a fat content of at least 75%, with Brillat Savarin this is achieved by adding rich, luscious cream to whole milk before the cheesemaking process starts. It ripens very quickly and therefore has an affinage of between only 1 and 2 weeks, which takes place in a dry cellar. The cheese is shaped like a small drum and is coated in a light penicillin mould giving it the appearance of snow. The texture is soft and the flavour is light and delicate but with a rich creaminess stemming from the additional cream. There can also be a slight sourness which nicely balances the richness. Brillat Savarin can be enjoyed at any time but is unusual in that it can be superbly paired with fresh summer fruits such as peaches and strawberries. It is also delicious enjoyed with a glass of Paxton & Whitfield own brand Champagne. One of our Confit range, this Apricot & Orange Confit is hand made in the French Pyrenees. The contrasting acidic and sweet flavours of oranges and apricots are an amazing pairing with soft cheese.